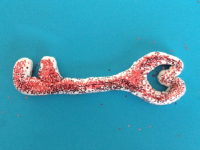 Santa can use this key to deliver gifts to children. 1. Gather your material. 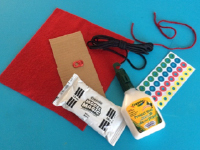 You will need red felt, red yarn, scissors (not shown), cardboard, white Model Magic dough, white glue and/or hot glue, black parachute cord, red glitter (not shown), a metal soda can tab, and red hole reinforcements. 2. 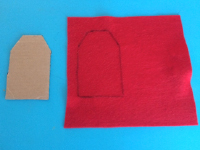 Cut a simple keychain shape out of the cardboard and trace it on the red felt, folding the felt in two so that you end up with two identical shapes. 3. 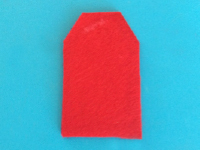 Glue the felt shapes on either side of the cardboard keychain. 4. 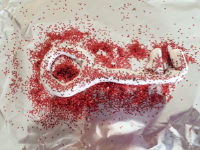 Use the Model Magic dough to shape an old-fashioned key. Sprinkle red glitter on both sides. 5. Reshape your key if necessary and set it aside to dry and harden per package instructions. 6. Use the black parachute cord to represent Santa's belt. 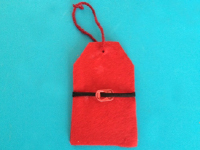 Simply thread the metallic tab onto the cord (belt buckle) and wrap it around the centre of the keychain that will become a Santa Claus coat. Glue the cord on the back of the keychain to hold it in place. Make a hole at the top of the keychain and press a hole reinforcement on either side. Thread a piece of red yarn through the hole. 7. 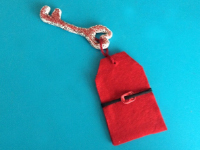 Slide the red yarn through a hole in your magic key and tie a knot. Santa's magic key is ready!